If you or someone in your family suffers from breathing problems, headaches, sore throats or skin irritations, this may indicate the presence of hidden contaminants in your home. In addition to health problems, you may notice foul odours or soot stains. Decontamination of the premises could increase your quality of life. Reno-Assistance can find you qualified contractors, who have obtained our 360° seal of approval. They'll come and clean up your home! What are the common types of contaminants we find? Whether you call it mold or mould, it's the same thing in the end. Mold is the most common way to write it (the American vocabulary) and mould is used in the Canadian dictionary, but not as common as mold. 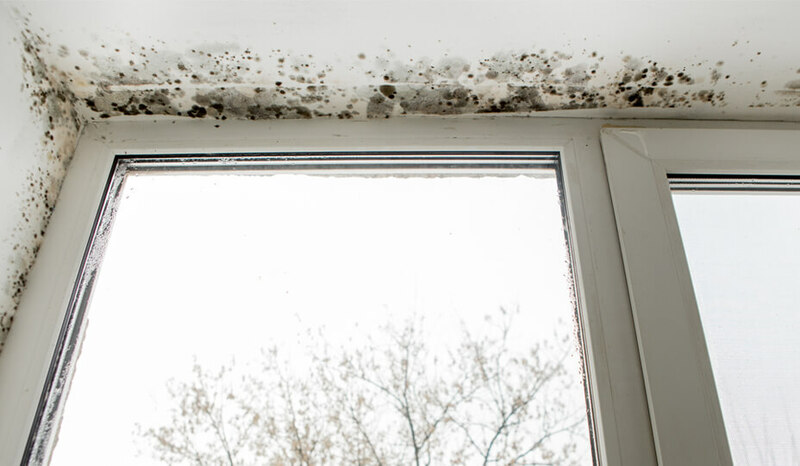 High moisture levels can cause mold growth in sensitive areas, such as bathrooms, attics that lack ventilation, basements, laundry rooms and walls where there may have been infiltration. Water infiltration from the roof or damaged pipes are also other potential sources. 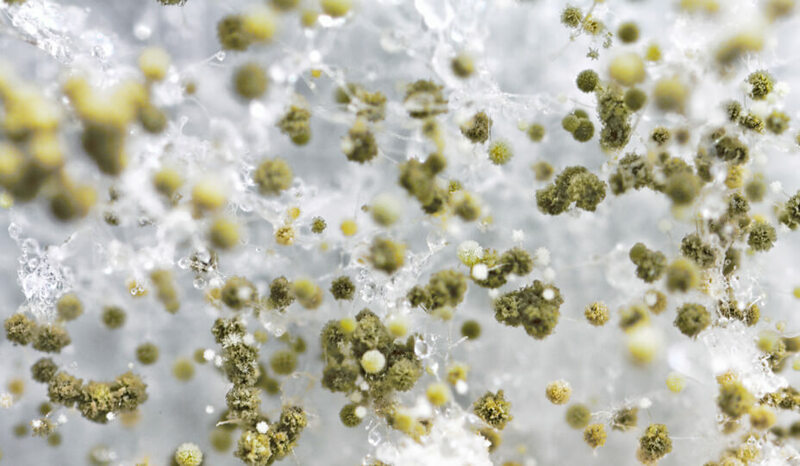 Mold is often created by infiltration of water, or water vapour, that remains trapped in closed areas of your home. It is common to see mold on the walls, in an attic or any space with high humidity and that may be poorly sealed. How to get rid of mold? First of all, it is essential to find the source and the cause of this problem to correct it before everything is spread. 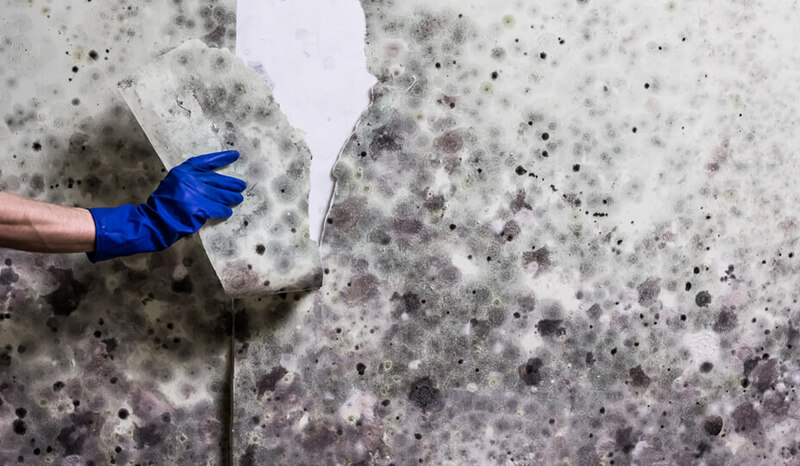 Once this problem is resolved, the decontamination contractor can begin work by removing the larger layers of mold by rubbing them with a special scraper. 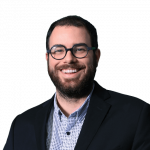 The contractor will then apply a product made to decontaminate and destroy the remaining mold and prevent their expansion by destroying all forms of life on the entire surface, in addition to decontaminating the ambient air if necessary. It is possible that some spots remain, but they will no longer have any harmful effect on your health. Pyrite, a mineral found in stone, produces sulfuric acid when it comes in contact with moisture and oxygen. 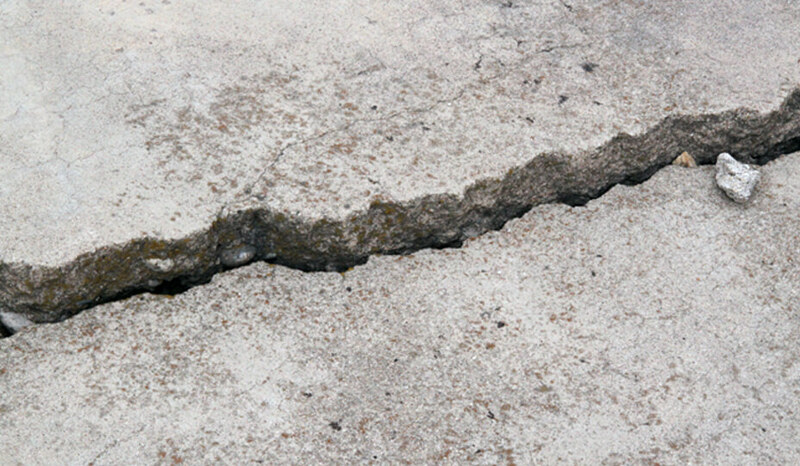 When this reaction occurs in the foundation, it can cause cracks. Pyrrhotite, on the other hand, is a copper-coloured mineral composed of iron sulphide that can blacken and crystallize into lamellae when exposed to air, which eventually produces cracks in concrete structures. This reaction is not harmful to your health. However, it can affect the structural integrity of your home or building by weakening the foundation. 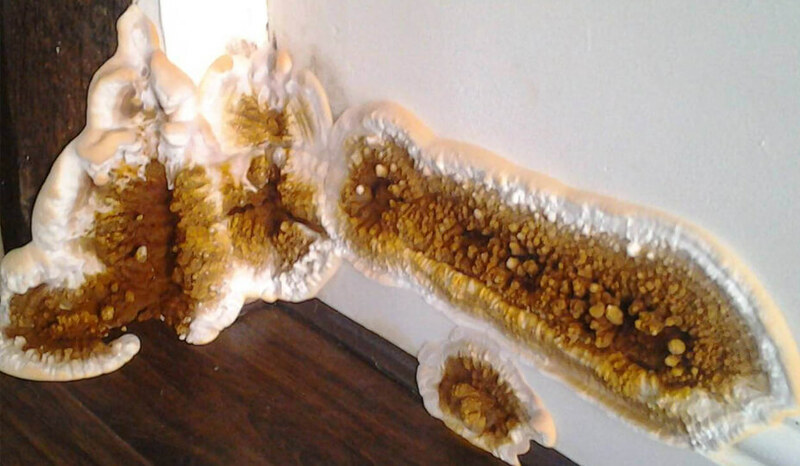 Often referred to as the "cancer of the building", this is a dangerous fungus that lives in dark, closed and wet places. It is found mostly in crawl spaces for example. It is not always as big and imposing as in this picture as often its infection begins only with slight white spots. To treat it requires a contractor who uses the right tools and products to apply chemical or hot air treatment to kill the contaminant and prevent its growth. Do not use a homemade recipe like bleach, it will have the effect of increasing the growth of mushrooms. This substance can be found in walls, ceilings, pipes, caulking, roofing, latex paint, vinyl tile and injection insulation. Use caution and consult a professional before removing. Asbestos is only dangerous to your health when cut or stirred. During work that would involve handling of this substance, it is important to call in a professional. They'll ensure the complete and safe removal of this substance. Since it's a highly dangerous product when inhaled and can cause serious diseases, you should not attempt to encapsulate, paint, or remove asbestos yourself. If you do, you'll release asbestos fibres into the air, says CCOHS. Expel the radon to the outside using a pump under the false floor. This technique is also known as depressurization under the foundation slab. Allow a renewal of the air through a heat recovery ventilator (HRV) that will increase the ventilation of your home. Seal the different openings and cracks in your walls or foundation that allow radon to move freely around your home. The same goes for the pipes and the evacuation pipes. If you discover any of these problems in your home or any other such as spills of matter like oil, you'll need to find a decontamination specialist to identify the source of the problem. They'll fix it and decontaminate it before your health suffers. Let Reno-Assistance help you right away for free! 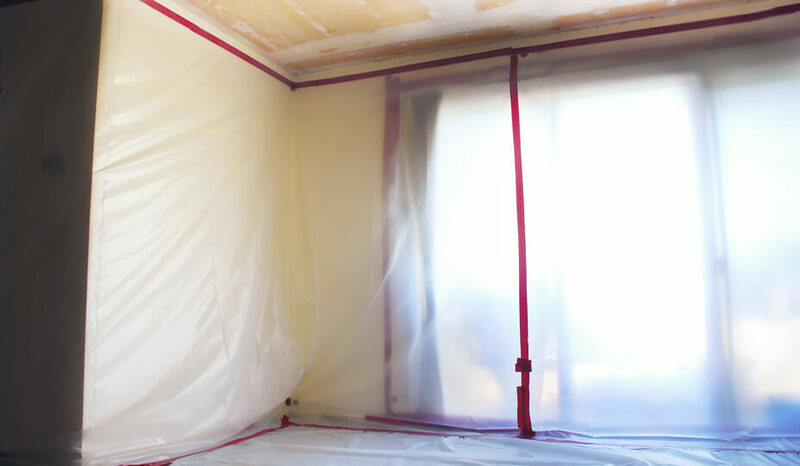 It’s best not to try to decontaminate a problem area of your home by yourself. By touching it, you could potentially spread the contaminant in the air, causing further problems. When you call Reno-Assistance, one of our experienced Renovation Advisors will send you up to three decontamination specialists who have attained our 360° stamp of approval, so you know that they are the best for your job. Your advisor will also help you evaluate their quotes and help you choose the decontamination specialist who’s right for you. Don’t put up with your contaminant problem for one more day. Fill out the form to the right and let us send you the professionals you need to decontaminate your home and ensure the health and well-being of you and your family.